At Uddari, we are happy to find a beautiful poem by BC based Indo-Canadian author Ajmer Rode inscribed in bronze in Seattle, USA. 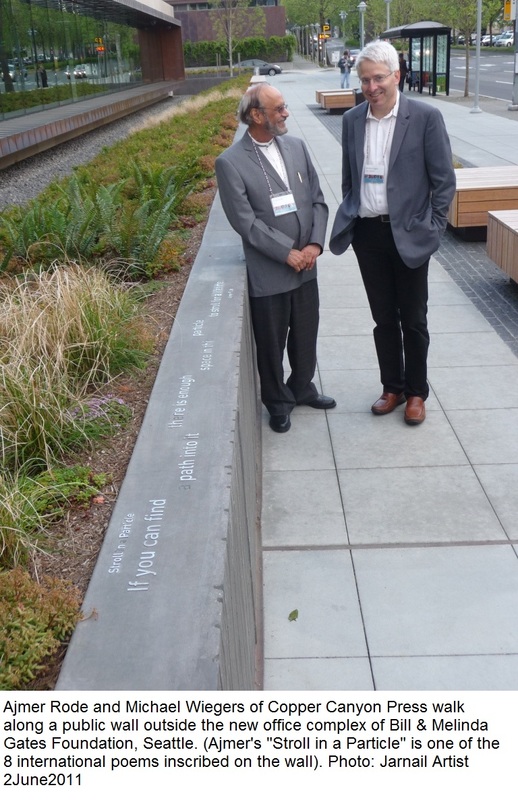 The poem, added in May 2011, appears on a wall outside the new office complex of Bill & Melinda Gates Foundation. to stroll for a lifetime. 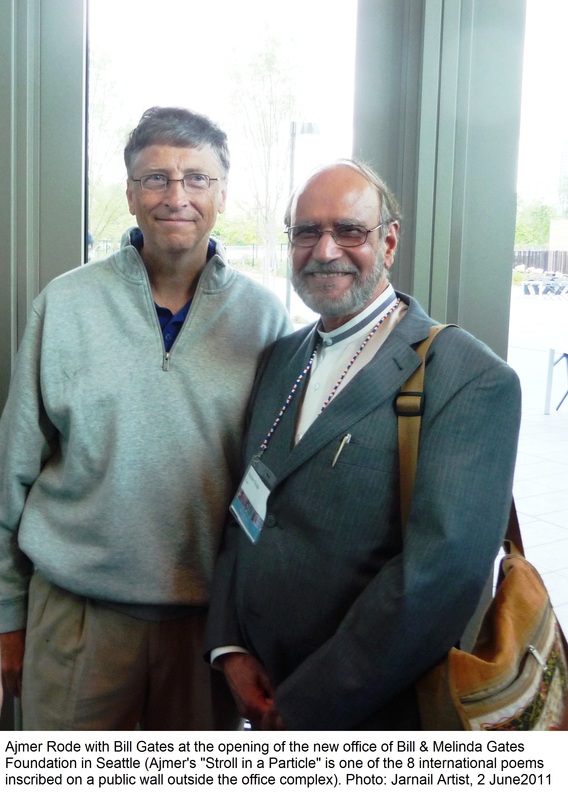 The selection was made by editor Michael Wiegers who was contracted by the Gates Foundation to make recommendations. Wiegers picked Ajmer’s poetry from the Poetry International Web site at www.poetryinternational.org where his poems are published in English and Punjabi. Ajmer’s poem was selected from an initial collection of 48 poems written by poets Eritrea, Zimbabwe, U.S., China, Czech Republic and Palestine/Israel. Ajmer’s two poems, ‘Stroll in a Particle’ and ‘Big Numbers’ made the second round. At that point the editor had recommended ‘Big Numbers’ but because of the size constraints the Foundation approved the smaller ‘Stroll in a Particle’ for inclusion in the final eight. Ajmer Rode is an amazing poet who has received many distinctions for his poetry in Canada and India. He is an active member of various writers groups including The Writers Union of Canada. As well, he has, with his wife Author Surjeet Kalsey, pioneered Punjabi theatre in British Columbia by writing and directing stage plays on burning societal issues; and, they are both founding members of the largest organization of Punjabi writers in BC.